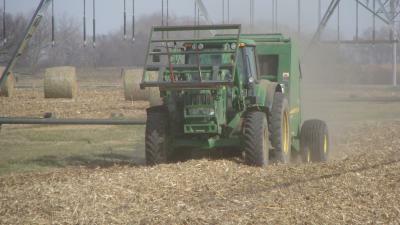 Biofuels - ethanol - were trumpeted as being a renewable alternative to fossil fuels for decades. Finally, in 2005, it got the mandates and subsidies environmentalists insisted were necessary to make inroads against a mature industry like petroleum. Immediately, what scientists knew became evident - they were more resource intensive to produce, were no better for emissions, and subsidies insured there was no reason to get more efficient. Worse, the gold rush of government money drove up corn prices, unfairly impacting the poor. Another paper has confirmed it was a bad idea, no matter how many times Vice-President Al Gore insisted in the 1990s it would save us. And even using more parts of corn plants won't help. Writing in Nature Climate Change, the University of Nebraska-Lincoln team cast doubt on whether corn residue can be used to meet federal mandates to ramp up ethanol production and reduce greenhouse gas emissions. Corn residue being baled on a University of Nebraska-Lincoln field experiment site in Saunders County. Credit: University Communications/University of Nebraska-Lincoln. Corn stover -- the stalks, leaves and cobs in cornfields after harvest -- has been considered a game-changing resource for cellulosic ethanol production in the always moving target of how biofuels will succeed. To-date, the U.S. Department of Energy has provided more than $1 billion in federal funds to support research to develop cellulosic biofuels, including ethanol made from corn stover. Cellulosic biofuel production hasn't really been commercialized but various subsidized private companies are developing specialized biorefineries capable of converting tough corn fibers into fuel. roughly equivalent to 1 BTU - of biofuel energy produced. Total annual production emissions, averaged over five years, would equal about 100 grams of carbon dioxide per megajoule - which is 7 percent greater than gasoline emissions and 62 grams above the 60 percent reduction in greenhouse gas emissions as required by the 2007 Energy Independence and Security Act. The rate of carbon emissions is constant whether a small amount of stover is removed or nearly all of it is stripped.